Did you know that March, April and May are the biggest months for greenhouse purchases? If you’re buried in snow, building a greenhouse doesn’t have much appeal right now. If you already have a greenhouse, you’re going to be busy getting prepared for your spring growing season. This is the time to cheer yourself up with seed catalogues. There are so many beautiful ones available. We don’t have any affiliation with these, but they are my personal favorites. 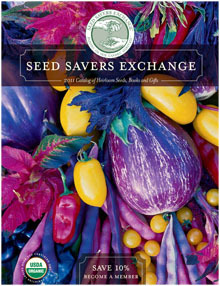 Seed Savers Exchange – If you don’t know about this wonderful resource, you should. Many are available online in pdf format, so click away, and enjoy!